A big development project has been announced for Phnom Penh as a joint venture between Singapore Oxley Holdings and Cambodia World Bridge Land plan to construct a twin-towered commercial building called The Bridge. Standing a proud 45 storeys tall in the heart of Phnom Penh, The Bridge promises to be the icon of the district. This majestic development occupies a land area of 10,090sqm and consists of a five storey retail podium with two distinct tower blocks interlinked by two skybridges to offer access to all that the development has to offer. The Bridge’s towers will feature total 2352units, comprising 627 commercial units, 762 apartment units and 963 SoHo. According to the Phnom Penh Post Oxley Holdings general manager Chinh Chiat Kwong said that his company would start building the twin towers in April & are expected to take three to four years to complete.According to Kwong, the principle issue was building to Singaporean construction standards while incorporating traditional Khmer architectural themes. 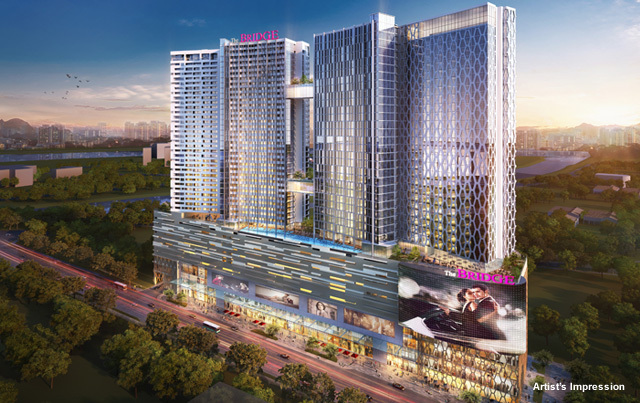 Sales of residential and office space in the 154-metre-tall project will get under way in Q2 2014.